This delightful seaside retreat delivers all that you'd expect from a house by the sea. Painted weatherboarding, a country kitchen complete with butler sink, and an enormous fireplace to snuggle up in front of. And it is (mostly) painted in the colours you'd expect - misty ocean greys, greens and a lovely soft white. But then there is the red. A powerful and energetic shade of red has been used on the dining room walls (did you know that red stimulates the appetite?) and then crops up as an accent colour all around the house. It's unexpected and impactful and we love it. Walls - Sharkskin (2139-30), Trim - White Opulence (OC-69), Door - Wolf Gray (2127-40). Walls - White Opulence (OC-69), Cabinets & Moulding - Stone (2112-40), Door - Wolf Gray (2127-40), Trim - Moonshine (2140-60). Walls - Caliente (AF-290), Trim - White Opulence (OC-69). Walls - Whie Opulence (OC-69), Door - Caliente (AF-290), Trim - Wolf Gray (2127-40). Walls - Silver Marlin (2139-50), Trim & Ceiling - White Opulence (OC-69), Door - Wolf Gray (2127-40). Window Frame & Railings - Wolf Gray (2127-40). Walls - Caliente (AF-290), Alcove & Ceiling - White Opulence (OC-69). 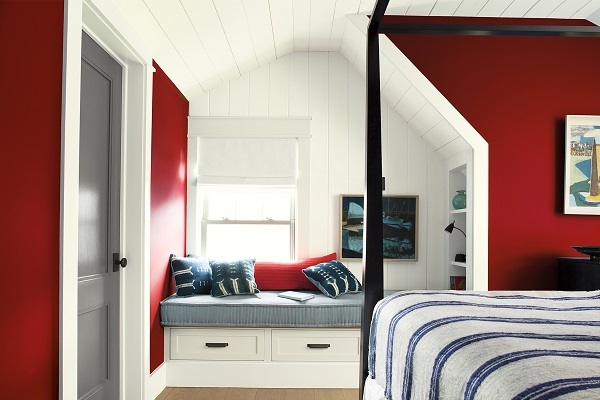 Caliente is Benjamin Moore’s Colour of the Year for 2018, and is a vibrant and versatile shade. It brings radiance to the bedroom and dining room, and complements its surroundings, from the wood tones of the dining room to the inviting nautical stripes of the bedroom soft furnishings. It plays an important role throughout this home and demonstrates how a range of shades can work together in harmony. Benjamin Moore products are distributed exclusively in the UK by Shaw Paints Ltd. Established in May 2015 by founder Craig Shaw, Shaw Paints Ltd. shares the vision and values of Benjamin Moore and wishes to extend the company’s industry leading brands, products and services to become the clear benchmark for colour and quality in the UK.